The American Journal of Pharmacogenomics has been merged with its sister journal, Molecular Diagnosis, under the new title Molecular Diagnosis & Therapy. 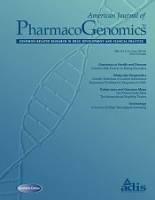 The last issue of the American Journal of Pharmacogenomics is Volume 5, Issue 6. With a focus on linking diagnostic and prognostic biomarkers to an appropriate therapy, Molecular Diagnosis & Therapy emphasizes the development of companion diagnostic/therapeutic products and the use of pharmacogenomic data in drug development, therapeutic decision-making, and personalized medicine. Archived content for the American Journal of Pharmacogenomics will continue to be available (see link on left) and is free to current subscribers to Molecular Diagnosis & Therapy.